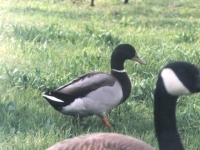 Males have green head with white neck ring, chestnut breast and grayish body. Females mottled brown with white tail. Bill mottled orange and black. Voice: You guessed it - "quack". Range: Breeds from Alaska to quebec and south to Virginia, Texas and northern Mexico. Winters from the United States into Central America. Mallards are also found in Eurasia. The most abundant duck in the world. 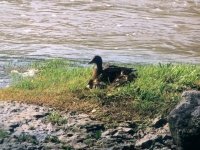 You can find Mallards on almost any body of water. The last figure we saw stated that there were over 10 million Mallards in North America.